The NAB Wrap-up panel at the June BAVUG Meeting. 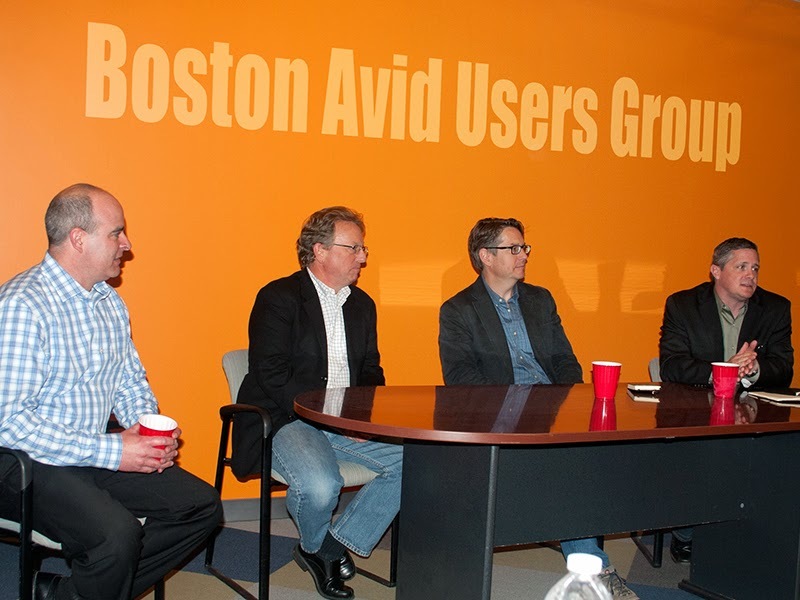 Last Wednesday was the June meeting of the Boston Avid Users Group (BAVUG). This month's topic was a wrap-up of the important announcements from NAB. The NAB wrap-up discussion panel featured The OutPost at WGBH's Chris Fournelle and Michael Amundson as well as Kyle Frazier from HB Communications and Bill Reinhart of Avid Technology. This month's meeting, held at HB Communications, was a departure from a typical BAVUG meeting. Instead of a presentation, the meeting was more of an interactive discussion led by a panel of experts. The consensus was that 4k and cloud applications were the most important announcements this year. As far as 4k goes, it's believed that the end-consumers will drive the adoption, but there is value in ramping up productions now. As has always been, the higher quality of the video in the acquisition stage means a better quality final product, no matter what the final deliverable format will be. This is why in the days of SD, a lot of programming was acquired on film. With the costs of 4k capable cameras very reasonable, the current obstacle for full 4k adoption, is the cost of quality 4k monitors. Michael stated that monitors for 4k need to be at least 50 inches and you need to be close to the monitor for accurate image control. Shooting in 4k now, has other advantages as well. If you master in 4k, your projects are ready when the format is fully adopted. Another advantage is enabling an editor to modify the composition of the shot in the edit suite. Source shot in 4k can be cropped when mastering in HD without a loss of image quality. An interview can be shot wide and then different focal lengths can be extracted from the source later. Although this may not be music to a DP's ears, it allows for greater flexibility at greater economy in the edit suite. Applications in the cloud allow for greater collaboration in archiving, remote editing and review - approval. Or as Bill called it, Media Everywhere where asset management is key. The cloud doesn't necessarily mean the cloud lives outside the four walls of a facility, what is important is that everyone has access to all the media that is available. The Avid Interplay systems for larger facilities already have these capabilities. Avid Media Composers within the facility and remote locations can connect to the same media and make changes. Clients of these facilities are able to review their cuts and make notations that are immediately visible to the editor. Most of the advantages of the cloud are available to the larger facilities right now. It's only a matter of time until the independent video pros will have access to this same technology.